Cape Town – The National Union of Metalworkers of South Africa (Numsa) has called on government to nationalise all businesses owned by the Gupta family, while it is being investigated for corruption related to state capture. “In exactly two days the lives of at least 7 500 workers and their families will be plunged into uncertainty because Gupta-owned companies will lose the last remaining banking facility for their operations,” the trade union said in a statement released on Thursday evening. The North Gauteng High Court on September 21 dismissed the Guptas’ urgent court bid to prevent the Bank of Baroda from closing its bank accounts. This means they have to remove their money from the bank by the end of September. The application was dismissed with costs. Twenty companies controlled by the Gupta family had instituted legal action against the lender to try and stop the termination, which comes after South Africa’s four biggest banks, and three international banks, cut banking services for the family. Gupta-owned companies who are set to lose banking services include including Annex Distribution, Sahara Computers, VR Laser Services, Koornfontein Mines, Oakbay Investments, Optimum Coal Mine, Shiva Uranium, Tegeta Exploration, and Mabengela Investments. 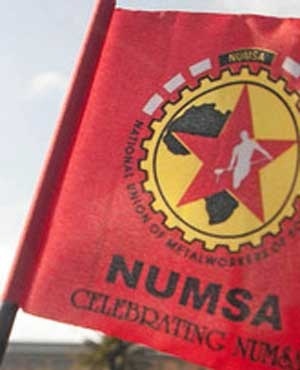 Numsa said in its statement it sympathises with the workers at all the affected companies. Nationalisation of these companies, Numsa argued, would protect the jobs of thousands of workers. “It is not the ideal solution because the ANC government is part of the problem, but it is the only way to save workers and their families from a life of guaranteed poverty. “Given the scale of the high levels of unemployment, it is unlikely that these workers will find future employment should the bank account closures lead to job losses. Therefore the state has a duty to save these workers and their families from a life of guaranteed poverty,' it said. The trade union added that, while it believes the Gupta family and their connections to the Zumas must be fully investigated, workers and their families should not suffer because of decisions made by politicians. Some funds associated with two Gupta-owned coal mines have already been frozen in the Bank of Baroda by an order of the North Gauteng High Court in Pretoria. On Tuesday anti-corruption advocacy group the Organisation Undoing Tax Abuse (OUTA) won an urgent interim interdict to freeze some R1.75bn in mine rehabilitation funds from the Optimum and Koornfontein coal mines. The funds, meant to manage environmental damage caused by mining, were kept at the Bank of Baroda. “The interim order directs the Bank of Baroda to continue to hold the trust funds of the Optimum Mine Rehabilitation Trust and the Koornfontein Mine Rehabilitation Trust in interest-bearing accounts in the trusts' names,” said OUTA in a statement earlier this week.